Although an iOS device can be easily secured by means of a passcode, the continual inputting of your secret combination can quickly become repetitive – to the point where you may feel locking your device isn’t so important after all. Unfortunately, aside from the passcode, Apple doesn’t offer any other means of protection against nosy folk in general. As such, the onus once again rests with the third-party developers of the App and Cydia Stores to compensate, which they always manage to do with aplomb. 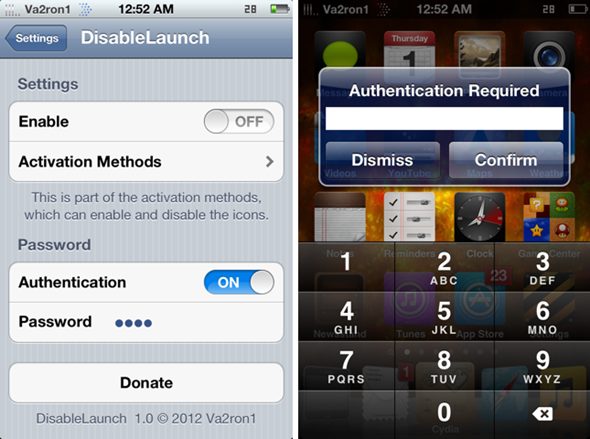 DisableLaunch, a tweak compatible with devices running iOS 5 upwards, allows you to enable and disable your SpringBoard icons using simple activation methods. Additionally, you can add a password which will need to be typed in order for your icons to resume normality. You can choose your desired activation method in the Settings app, in which you can also change your authentication code. With many tweaks bereft of even the most basic of settings configurations, it’s good to see the options available in this tweak for users to tailor the experience. There will undoubtedly be certain times or occasions where you’d need more security on your device than others, so you can also enable or disable the entire function of the tweak accordingly. Created by va2ron1, it’s free, and available right now over at the BigBoss repository. The BigBoss repo is listed in your Cydia Sources by default, so simply refresh, search for "DisableLaunch", and install – making sure to respring or reboot before using the tweak.